County Farm Bureaus across the state work to support young people through contests, scholarships and education. Their goal is to help the youth understand the importance of agriculture for their communities and the world. 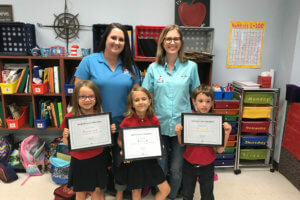 Jefferson County Farm Bureau hosted contests for first- and fifth-graders attending Osceola Christian Academy in Monticello and Community Leadership Academy in Tallahassee this month. The fifth-graders participated in an essay contest where they answered an assigned question: “Why is agriculture important to America?” There were a total of 39 participants in the contest. Each school had first-, second- and third-place winners who received certificates and cash prizes. The first-graders participated in a poster contest that required them to depict a farm scene. The poster contest had a total of 37 participants. Cash prizes and certificates were given to the first, second and third place winners. Jefferson County Farm Bureau hosted a pizza party for each class participating in the competitions and an awards ceremony to celebrate their hard work. Sean Allen, a local forester for Jefferson and Leon counties, volunteered to help out for the day by teaching the students about fire safety and providing goodie bags. Another contest on the horizon for county Farm Bureaus is the Youth Speech Contest. County Farm Bureaus around the state will host 14 to 18 year olds interested in agriculture in a contest that will educate students and the public about the industry. The contest is intended to prepare students for public speaking and this year focuses on agricultural mobile technology. Be sure to look for community projects sponsored by your county Farm Bureau.